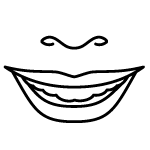 The following information will help you get the most out of your dentures. A daily routine will keep your dentures looking like new and help them last longer. Your Prosthetist will show you how to put in and take out your denture. Feel free to ask questions and make sure you are comfortable with putting them in and taking them out before you leave the clinic. A little secret to assist removing your full upper & lower plate is to close your mouth, pinch your nose and blow hard, not letting any air out of your mouth. This should dislodge the denture for easy removal. 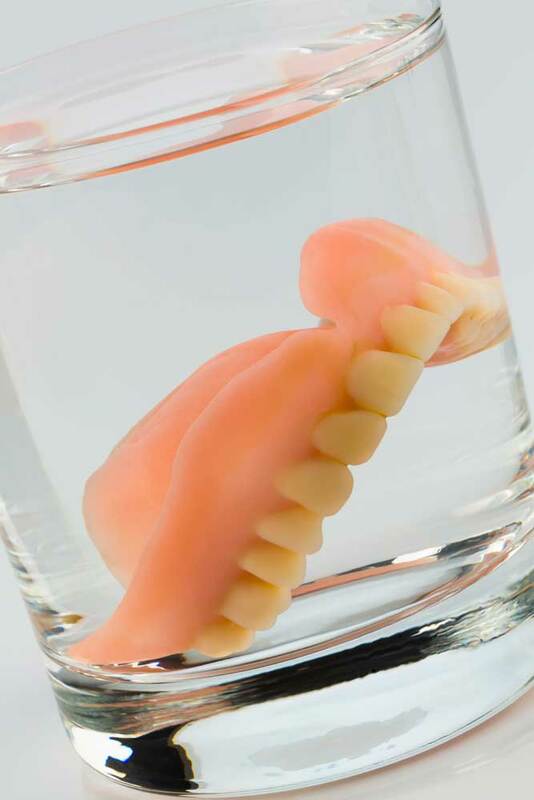 A common question is often “should I leave my dentures in overnight?” We’ve all seen the picture of dentures in a glass of water on the bedside table. Ultimately this is a very personal decision. We do recommend taking your plate out at night if you can. Removing your dentures at night allows your gums to rest. It also prevents grinding your teeth, which is very common in many patients due to the stresses of life. Grinding your teeth can lead to other complications, so removing your plate is advisable. After all we don’t wear our shoes to bed we like to give our feet a rest, our gums are no different it really is best to remove them if you can. However If you simply can not stand to be seen without your plate then that is fine too, at the end of the day you must do what suits you best. If however you are comfortable then yes, it is advised to pop them in a glass of water or denture bath overnight. Clean your dentures daily using a soft denture brush and mild soap and water or denture paste. Standard toothpaste is not recommended. Food particles and plaque need to be cleaned from all denture surfaces daily. It is recommended to clean your dentures over a water-filled sink to prevent breakage if dropped. Brush your gums, tongue and palate (roof of your mouth) morning and night with a soft toothbrush before you insert your dentures. This is good for circulation in your tissues and helps remove unwanted plaque build up. If you find that your denture has a build up (tartar or calculus), soak it in white vinegar (1 part) and water (4 parts). 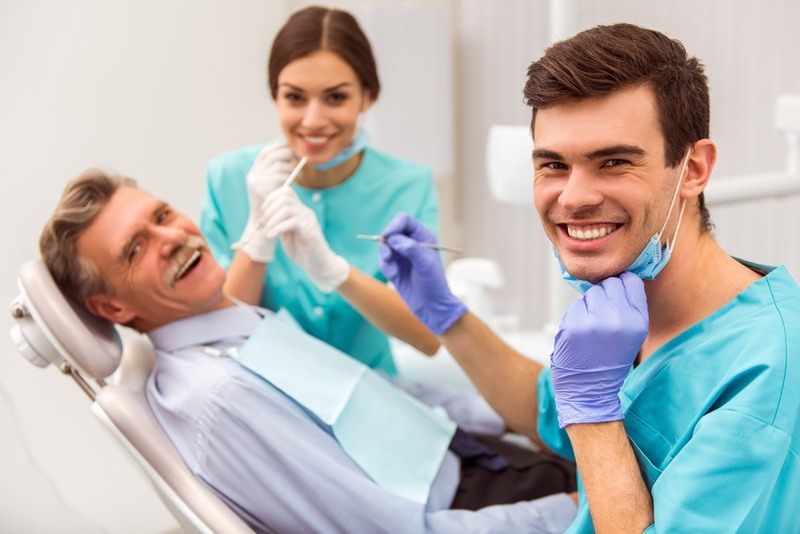 Because dentures can inadvertently accumulate a build-up of tartar and calculus just like your natural teeth used to it is recommended that you visit our clinic once per year for our complimentary denture clean. Once you have attended our clinic you will receive a yearly postcard informing you of your denture maintenance appointment. This is a very thorough clean and surpasses anything that you can do at home. Please allow a full hour for our lab to perform the clean. You are welcome to stay and enjoy a lovely cappuccino on us while we clean the denture, or you may chose to drop it off and collect it later. The choice is yours. If you have any other questions regarding the care of your dentures please feel free to phone us at any time on 9300 2332 or you may like to download this denture care brochure.